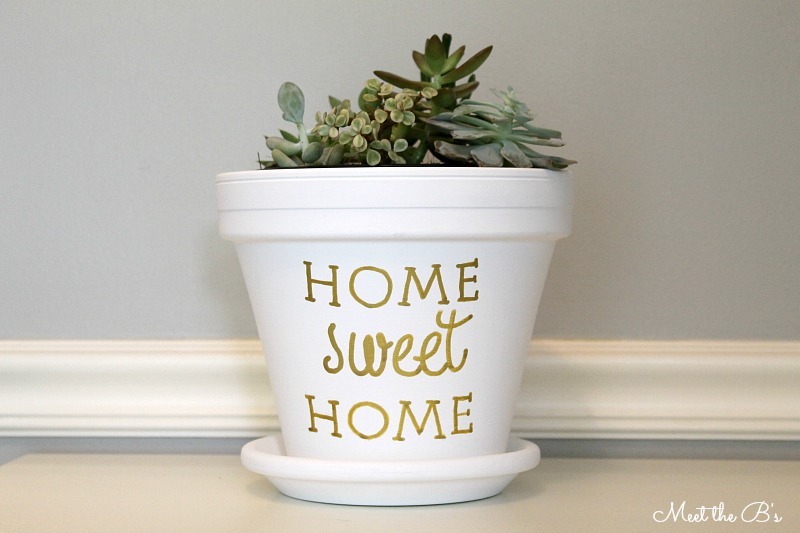 I love making gifts for friends and family, so when I found out that two of our close friends, Sarah and Tim, bought a house, I started brainstorming ideas for a housewarming gift. There are tons of cute ideas out there, but I wanted something that was somewhat unique and definitely easy to make! I've developed a little crush on succulents lately, so I decided to share my new love with our friends! Ready for how easy this is? Here's what I did! I started with a plain terracotta pot. You can buy these at any craft store or home improvement store. 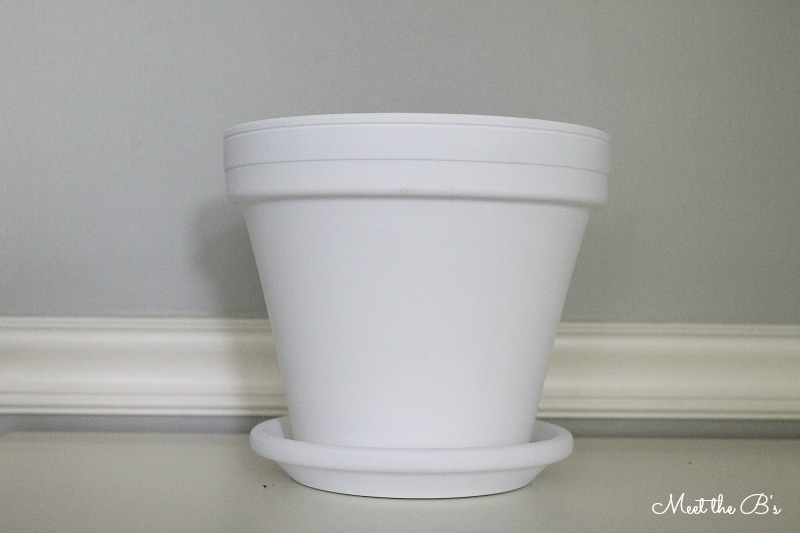 Then I painted the pot with a white acrylic paint. I used Americana paint in "snow white." 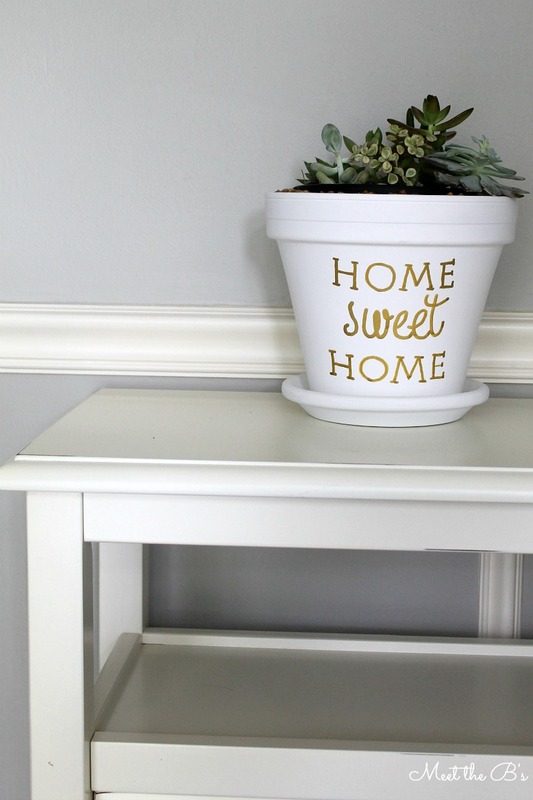 You can easily customize this to match decor by choosing different paint colors! You will need to do several coats of paint. Terracotta is very porous so it absorbs a lot of paint, especially if you are using a light color. I used a one inch brush to coat the entire outside of the pot. Let dry in between coats. 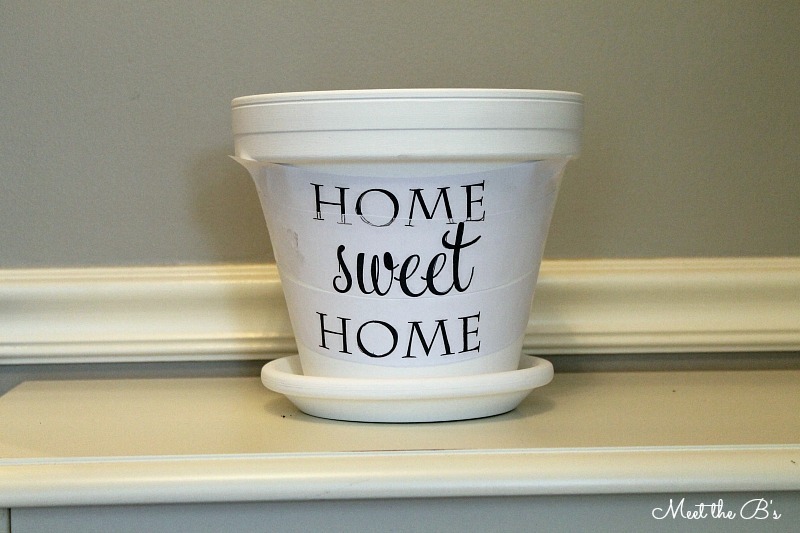 I chose to write "home sweet home" on the front of the pot. Fitting for a new home, right? To add this text, I used my favorite text tranfer method so that I could use a pretty font. I'm not always great at free handing pretty script, so this gives me a lot more options! I used the fonts "charlemagne" and "feel script." For a full tutorial on how to transfer fonts see my text transfer page! After transferring the text, I traced it with a gold paint pen to give it a little bit of glam :) I think gold makes anything gorgeous! Next, I bought a variety of succulent plants from my local home improvement store. Be careful when working with succulents. They are fragile and you will likely have a few pieces break off, but one great thing about succulents is how easily you can propagate their cuttings! 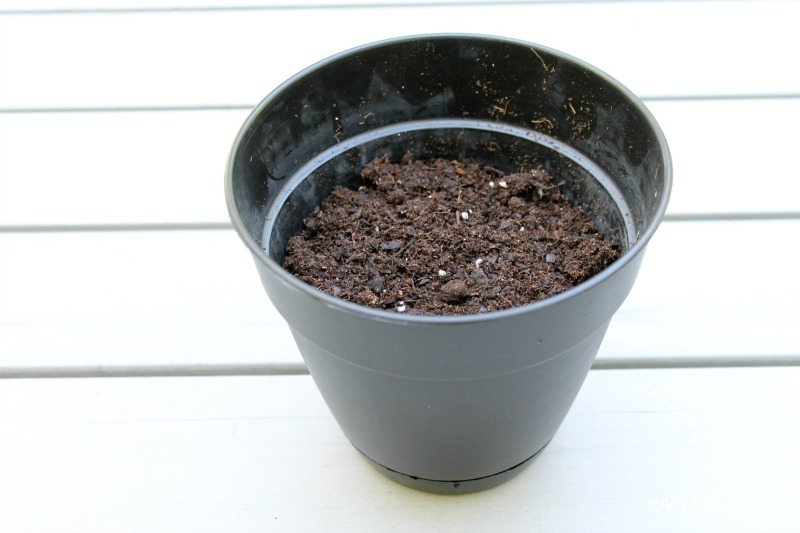 So save a few pieces to grow a succulent garden for yourself! Don't you just love succulents? I was swooning over them before I even got them out of the plastic pots they came in! Obsessed!!! I decided to put the succulents into a separate pot. 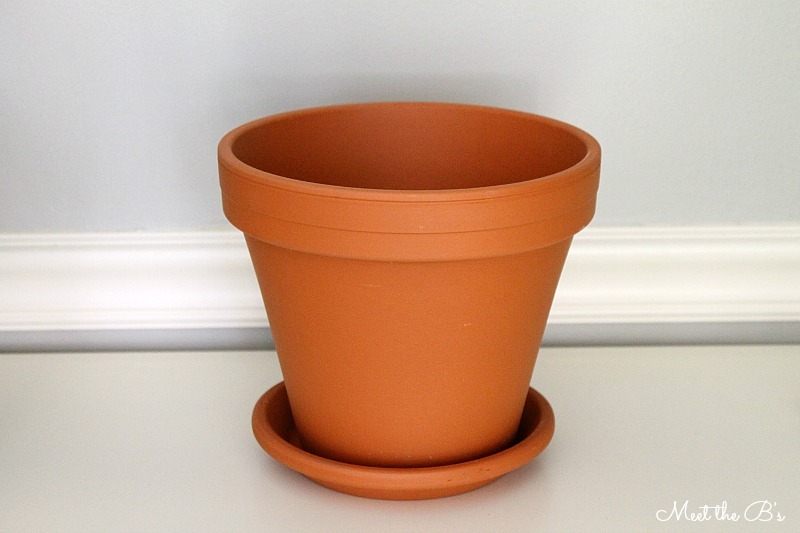 I learned after making my painted spring planters that water will seep through the terracotta and possibly stain the paint, so I chose a slightly smaller plastic planter to fit inside of the painted terracotta pot. First, I filled the bottom with gravel to help with drainage. Succulents DO NOT like to sit in water. Then, I added the succulents! Make sure to give them space to spread. 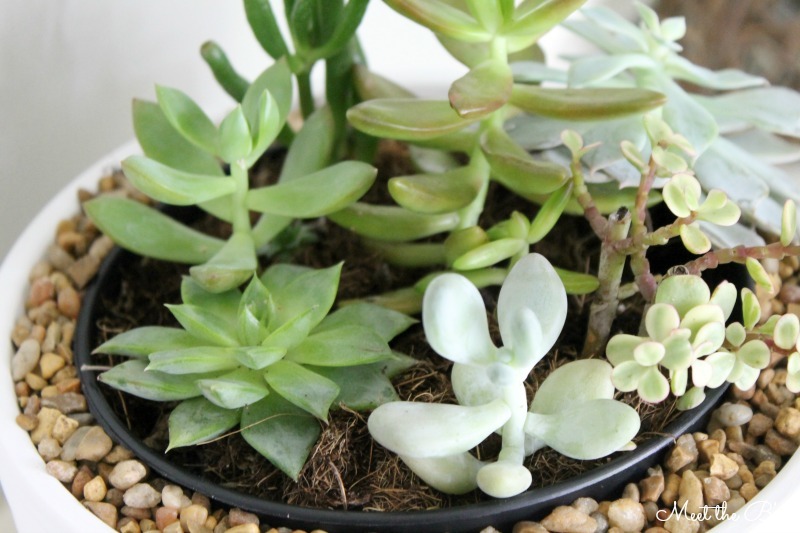 In the right lighting conditions, you'll see little mini succulents in no time! I carefully centered the plastic planter inside of the painted terracotta pot and then filled in around it with pea gravel. 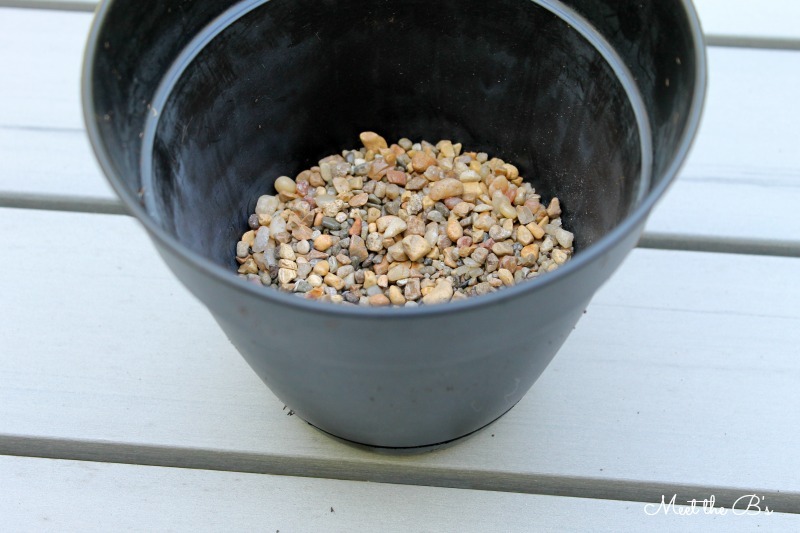 You can find pea gravel in many different colors, so you can easily customize here too! So that's it! Paint, plant, give! Easy peasy :) Instruct your newly home-owning friends to place near a sunny window, water once a week when the soil is dry, and enjoy! 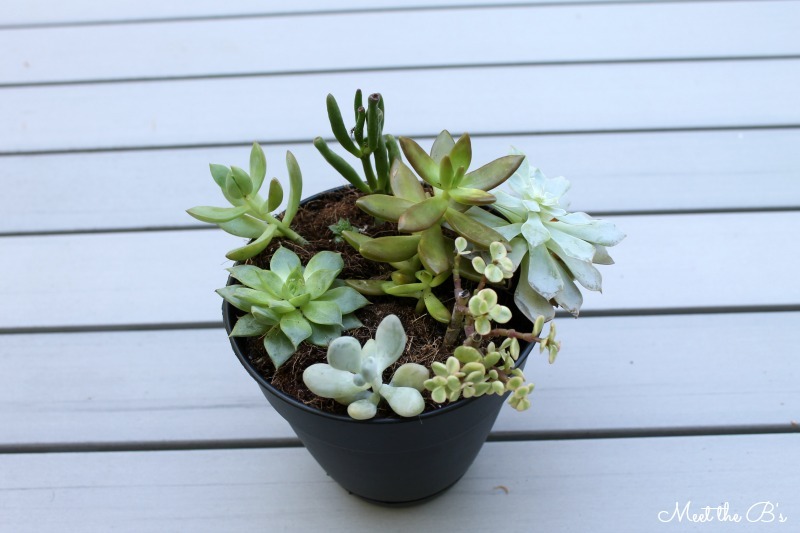 I think I might make one for our own home after my succulent cuttings grow in! 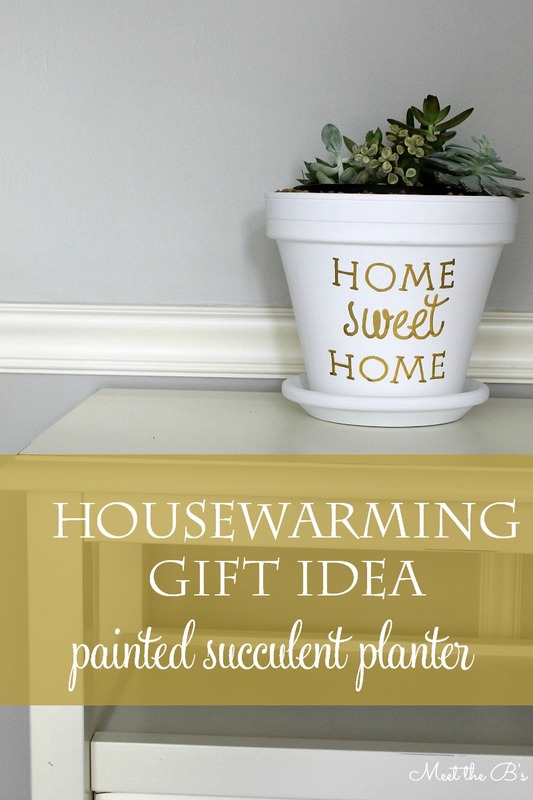 Do you have any unique housewarming gift ideas? I don't always have time to make a gift, but I LOVE TO when I can, so I'm always looking for great creative ideas! Anybody else obsessed with succulents?!?! I think they're just so stinkin' cute! Such a cute gift, Nicole! 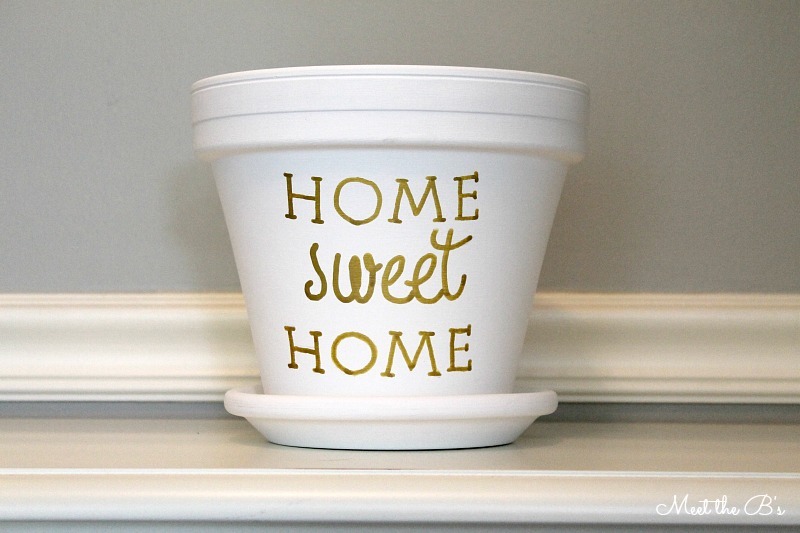 My sister moves into their new home next week and this is a great housewarming gift idea! Have a wonderful week! I am so happy! Finally someone who has put a pot in the painted pot. Every time I see directly planted terracotta pots all I can think of is how that paint can stain and bubble, anything glued on just slides off too - been there done that!!! Your solution is brilliant and the pot looks absolutely fabulous. I love everything about it, the white & gold, the succulents, everything! Thank you so much! I quickly learned that not using a second pot causes major problems!! This is SUCH a sweet gift idea Nicole! LOVE it! This is such a great gift! I have a black thumb, and succulents are always easy for me to keep alive! I love the gold and white combo too! This is so cute, Nicole! 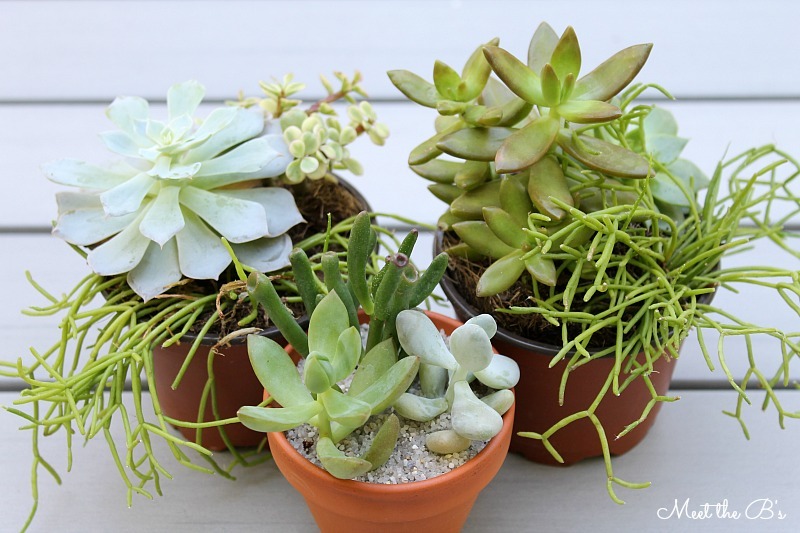 Your friends are lucky to have you around ;) You can never go wrong with succulents! Thank you, Bre! Succulents are the perfect gift! So cute! Great housewarming gift! I am going to include it in my fabulous finds friday this week! Such a cute idea! I love the gold words! Such a cute gift idea. And, you're right! Gold makes EVERYTHING gorgeous! Thanks for sharing with me and my lovely Pin Worthy Wednesday cohosts! I've pinned your post! This idea is so cute and I love the fonts you chose for the lettering. Thanks for sharing, can't wait to see what you do next! 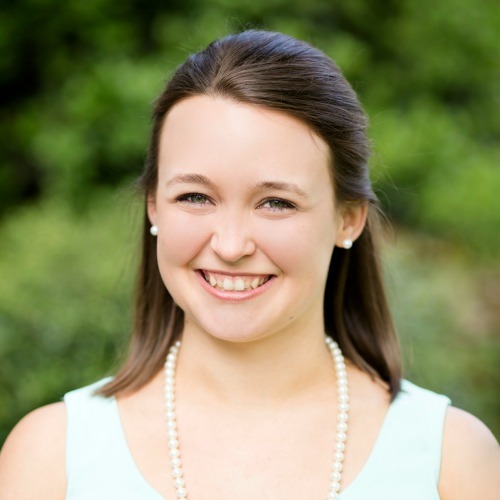 Kelsey @ the Vintage Storehouse & Co.
PS- Would love to have you share & link up at ReLoved Fridays! The link party is open until Monday!